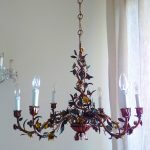 Elegant Italian AAA quality wrought iron chandelier with golden leaf decoration. Its curvy lines and the top covered with luminous rhinestones make this product unique and precious, a must-have in your home. This chandelier is part of a collection of wrought iron chandeliers made in cooperation with the best artists in Florence. It's a 8 arms chandelier with splendid hand decorated flowers. Rare Italian vintage 4 lights chandelier with beautiful birdcage shape decorated with stunning Murano opaline drops and Macaroni beads.